The movie is a dramatization of the writing of A Christmas Carol with a large dollop of artistic license. I think the liberties taken with the truth are mostly reasonable for the sake of drama, but they are certainly present. For example, it's true that Charles Dickens' father always had trouble with money, that he was always asking for loans and sometimes selling Charles' correspondence, etc. without his knowledge. 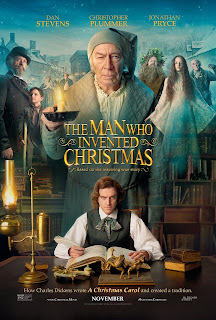 They did not, to my knowledge, reconcile over the same Christmas when A Christmas Carol was written. A Christmas Carol, along with much of Dickens' other work, was influenced by the times he had worked as a boy when his father was in debtor's prison, but we have no reason to think that writing this book granted him closure on this point. I'm making it sound melodramatic and silly, and it is, but the high melodrama is really what I loved about this film. More on that in a bit. We're introduced to Dickens at a low point. He's had several flops, his publishers are pushing for a sure-fire hit, he's running short of funds to run his London household, and he's beginning to worry that his career has already peaked. This is when he gets the idea for A Christmas Carol. The movie adds a plot around his parents coming to stay with his family, dramatically reveals his psychological issues and complicated moral opinions around privations suffered as a child, and brings various minor characters in and out to serve as inspiration. Plus, his characters literally come to life (in his mind, at least) and he must wrangle with them to figure out how the story will end. It seems rather ludicrous that something as short and perfectly crafted as A Christmas Carol would be begun without the core of the story (the climax) set out from the start, and in reality, A Christmas Carol was written quickly and as one piece, unlike Dickens' longer serialized work. Meanwhile, some of the "inspirational" moments (this person just said a line that's going to end up in the book!) seemed too obvious and clunky to me. The interactions with the fictional characters are somewhat justified by the fact that Dickens himself claimed to often hear his characters' voices as if they were external to him. And it may be silly for Dickens and Scrooge to have a shouting match about the worth of a man in the wreck of a factory where Dickens worked as a child, but you know what? I don't care. Because Dan Stevens is positively magnetic in this. He perfectly captures a mercurial, talented author at the height of his powers. His delight in the work and despair at the obstacles to completing it are both infectious. It's melodramatic, but so is A Christmas Carol! The balance between realism and fantasy (and truth and melodrama) could easily have tipped too zany or too sentimental, and for some viewers I'm sure it does. For me, the actors just manage to walk that line. It's not a perfect film, and it's not to everyone's taste. But if you are willing to follow its blend of biography, comedy, drama, and consciously sentimental holiday fare, you might have a heck of a lot of fun.